Volunteer to Save the Dragon! We need 2,300 volunteers between noon on May 14, and 5 pm on May 20, to help refurbish and expand Dragon Hollow. This will make Dragon Hollow an All-Abilities Playground. We need skilled and unskilled volunteers. To be on the construction site, volunteers must be at least 16; to be in the area, volunteers must be at least 10 years old. When Dragon Hollow Play area was built in 2001, the work was done by 4,000 volunteers in just nine days. If you missed the opportunity to be part of the gang, or if you were part of the gang and would like to do it again, here is your chance! 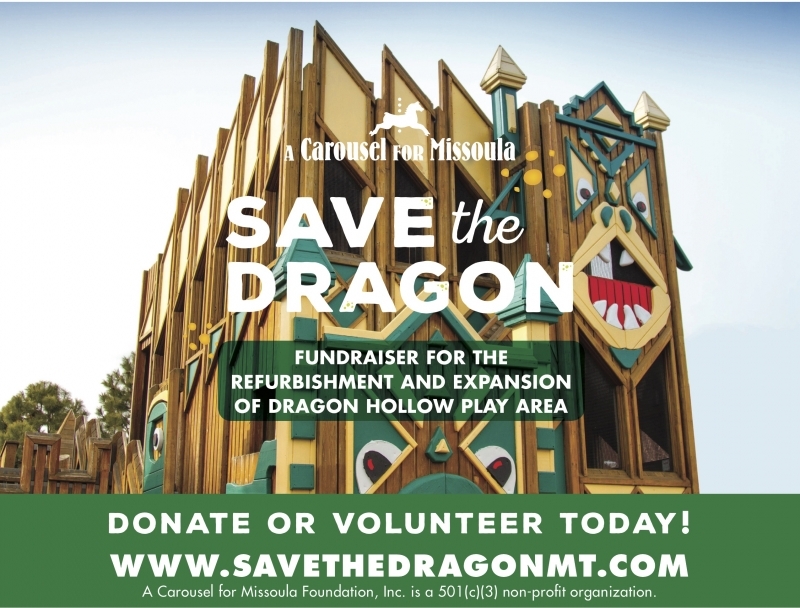 A Carousel for Missoula is overseeing the refurbishment and expansion of Dragon Hollow in mid May. Between Tuesday, May 14 at 12:30 pm, and Monday, May 20, at 5 pm, we need 2,300 volunteers to bring the play area to better-than-new condition, and to help rearrange and expand to create an ALL-ABILITIES PLAY AREA. 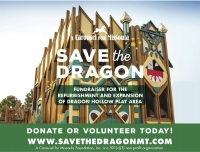 To volunteer, please go to SaveTheDragonMT.com and click the Volunteer button. You will be asked a few simple, non-intrusive questions, and can sign up for some or all of the shifts available. We are in particular need of Construction Captains. Ideally, the Captains are on site for all shifts, but two or more people can work together to perform the duties of one Captain. Construction Captains do not have to be skilled in construction; the most important attribute of a good Captain is good people skills. If you are interested in learning more about being a Construction Captain, please call the Carousel at 549-8382 so we can direct you to our Volunteer Coordinators. We have arranged child care for children 6 and under with licensed providers, we will serve meals and snacks on site, and we will offer transportation to and from the Mall during the week so you don't have to find a place to park downtown.